How can you use the limited time available, in the most effective way possible? This question has been the framework for thousands of time management books. It’s the question of time management. After reading a dozen or so of the top time management books, I started to see a lot of parallels between effective time management and effective money management. More specifically, what works in time management, has helped me look at some of the more difficult aspects of money management in a new and improved way. In time management, 20% of the input gives you 80% of the output. In other words, 20% of what you do, produces 80% of the results. In money management, 20% of expenses, contribute 80% of the benefit. For example, most people live 80% of the time in 20% of their home i.e. 80% of the space in an apartment or house is usually wasted. Another example, 20% of your belongings, are used 80% of the time. The goal in both time and money management, is to define the 20% that gives you 80% of the value, and eliminate the rest. Saving yourself money and time. I recently wrote on why I believe everyone should save for retirement, even those who never plan to retire. What I didn’t make clear was that retirement is by no means the end all be all. If your #1 financial goal for forty years is to save enough to retire, you’re doing it all wrong. The goal is finding the balance between now and the future. Nobody envies their friend who manages to spend every dollar they bring in. Likewise, you shouldn’t envy the friend who works 18 hours a day, then arrives home with only enough energy to crash on the couch. Both effective time and money management is about finding the right balance between the present and future. The first 100 minutes of my working day, 7:20 till 9:00, is spent writing. I don’t schedule meetings, pick up the phone, check email, or read the news during this time. If I waited until the end of the day, it’s hard to imagine having 100 minutes of uninterrupted time. It might be there, it might not. By scheduling time for writing first thing in the morning, I have made time no matter where the day takes me. Before I even see my paycheck, I have withdrawn 5% of it into a 401(k). This method of investing is commonly called paying yourself first. Just like my time, who knows if I will have an extra 5% at the end of the month? By paying myself first, I guarantee that the money is invested month after month. In the comments, see if you can think of other parallels between effective time and effective money management? If you don’t have a plan (or at least goals) – both time and money seem to slip away almost unnoticed. Love the 80/20 rule! I’m going to make it a point to sift through my life and clean it up a bit using this principle! So much physical and mental clutter builds up over time, it’s easy to forget that you have the power to simplify things. I’m right there with you. I’m overdue for a trip to Goodwill. What I’ve noticed is that downtime could be used being productive. I was up from 11pm-6am one night because of my off sleep schedule, and I was so upset with myself that I didn’t spend that time actually getting some things crossed off my to-do list. So in a nutshell, any time you say “I’m bored” is time you can be using being productive. Great quote from Thoreau. For those that like to know the name of things, the 80/20 rule is called the Pareto Principle. The Pareto Principle is a favorite of mine, I have used it in the Army and I still use it in my current job. 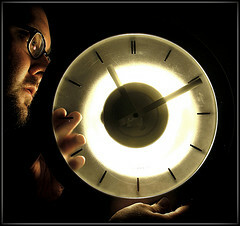 I think the biggest challenge is finding a way to make better use of one’s time, and it is a constant struggle. I am guilty of spending a large percentage of my time on management on employees who are not performing to standard instead of focusing my energy on those employees who not only meet the standard but are outperforming to make up for the drop in productivity of their ‘poor’ coworkers. If I could fire all the ‘poor’ workers and replace them with average employees I feel that it would make my life as the boss easier, but I think that the law of averages says that there will always be bad workers and therefore someone who was in the outperform category would drop into the perform or under-perform. Maybe its a vicious cycle we can’t break, but I see where it can play a big role in spending money wisely.